Whenever you take a bite of the pizza from the Dominos around the corner a good wood-fired pizza, it's always like taking the first bite. The magical taste is consistent and never changes for you. Idlys and Dosas are good breakfast, but pizza is better. You love pizza so much that, if you are getting a tattoo it's going to be a pizza. 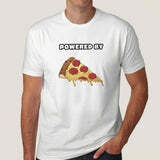 Keep the world informed that you are a pizzatarian with this 'powered by pizza' t-shirt.